This is the beautiful new Paloma Picasso collection, and it consists of scroll-like pendants and earrings in gold and silver (“Luce”); earrings in gold, amethyst and diamond as well as heart pendants in gold with diamonds (“Goldoni”); and star-shaped pendants, bangles, and a gold, diamond and deep blue enamel ring (“Stella”). 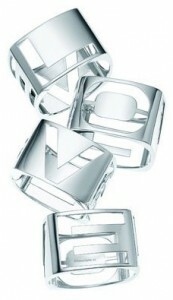 A 60s-70s-inspired little collection of sterling silver squarish bangles, a ring and a pendant, with a cutout letter on each side, spelling out LOVE. 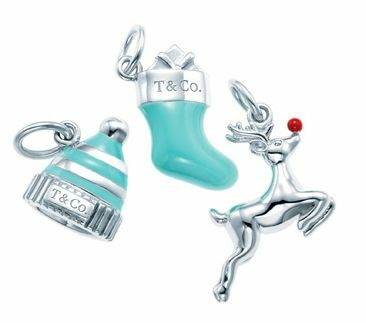 There are three new charms, all in sterling silver with Tiffany blue enamel, and all holiday themed: a reindeer, stocking and hat. These are three solid bangles in silver and gold in different widths, two with cutout lock images, and one with a cute little lock charm in silver and rose gold. Gorgeous and classic gold, diamond and red spinel necklace and bracelet by Jean Schlumberger (for those with a generous jewelry budget – they sell for $275,000 and $125,000, respectively). 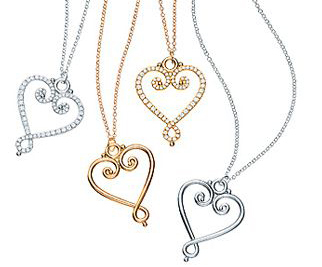 New from Elsa Peretti, a delicate and understated necklace and bracelet, both in relatively thin gold wire with a diamond at each end. 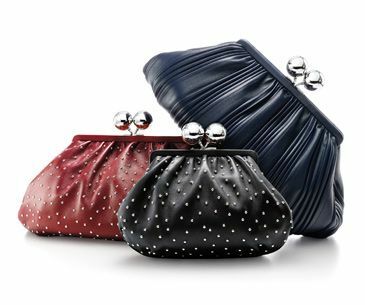 I know this is a blog about jewelry, but I can’t resist mentioning the absolutely adorable clutches in the new leather collection. The whole bag collection is fabulous, but the clutches… oh so cute! 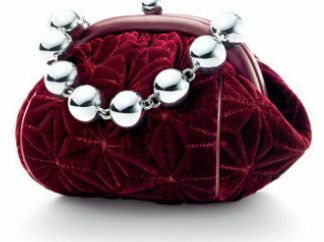 My favorite by far is the “bracelet clutch” in deep red velvet with a bracelet-like handle (and it’s a relative bargain at $995).